Here's a typical AMLP electric bill. Click the bill to enlarge it. VIEW AMLP'S TERMS & CONDITIONS OF SERVICE. 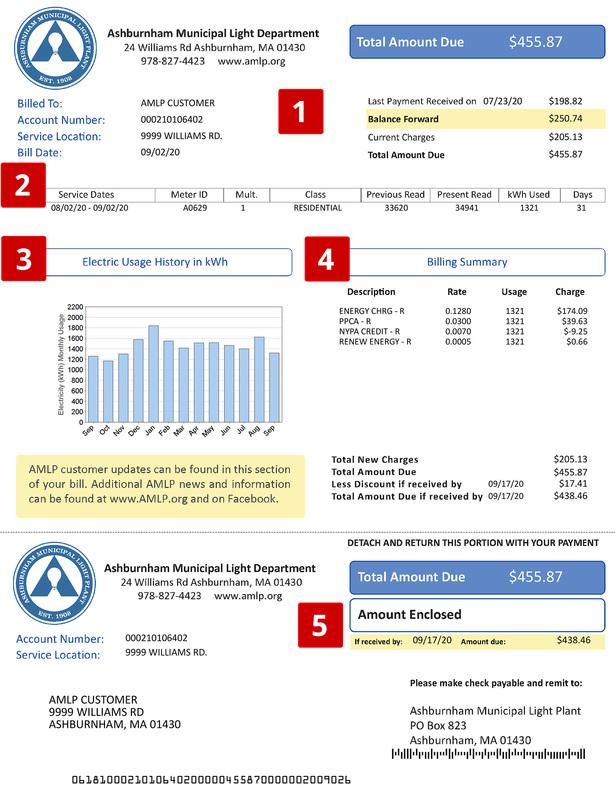 Ashburnham Municipal Light Plant reads your meter and mails a bill to you monthly for each account. Click here to Go Paperless and pay electronically. Pay by check or cash by visiting us here at 24 Williams Road. Mail a check to us at PO Box 823, Ashburnham, MA 01430. Got a question? Please give us a call at (978) 827-4423. This is AMLP's Bill Summary Area. Electric Service at: The exact location of your AMLP Electric Service, along with the name of the person responsible for paying the bill. Bill Date: This is the date your AMLP Bill was generated in our system. ACCT. NO. This is your AMLP Account Number. DISCOUNT The amount that you save if you pay by the "IF PAID BY" date. AMOUNT DUE The amount that you pay if you pay your bill by the "IF PAID BY" date. IF PAID BY Date by which your AMLP bill needs to be paid to receive your discount. GROSS AMOUNT Total amount due if you do not pay by the "IF PAID BY" date to receive your discount. AMOUNT PAID This is the area depicting how much you paid if you ask us for a receipt. On a regular bill you receive in the mail, this field is blank. BILLED TO: The person or entity responsible for paying the electic bill. FOR SERVICE AT: Electrical service address. ACCOUNT. NO. This is your AMLP Account Number. RATE This is your Rate Classification. Rates vary depending upon if you're a homeowner/renter, business owner or municipal entity. BILL DATE The date your bill was generated in our system. BILLED TO The date range for which you are being charged. PREVIOUS READING The number from the last time we read your meter. PRESENT READING The number from your latest meter reading. KWH USED This is the amount of electricity you used in kilowatts. NO. DAYS This is the number of days in the period between meter readings. Contains your history of electrical usage for the last 12 months. DEMAND KW The maximum rate of electricity consumption over a 15 or 30 minute billing interval, as defined by AMLP. Only applicable to certain rate category customers. MONTH Column The month of your service. NO. DAYS Number of days in that month's billing cycle between meter readings. KILOWATT HOURS The number of kilowatt hours you consumed during the applicable month. KWH/DAYS Average number of kWh per number of days measured. This area contains a breakout of all the components of your AMLP electric bill. PAYMENTS SINCE LAST BILL The last amount you paid AMLP. BALANCE FORWARD Your previous balance, if any. ENERGY CHG The amount on your bill for electricity provided by AMLP. PPAC RES PPAC Res = A charge used to smooth the fluctuating cost of fuel used to generate electricity. PASN CRED A credit to residential customers based upon hydropower generation. RENEW ENERGY R Rate decided upon by the MA state legislature to contribute to renewable energy. TOTAL TAX Taxable amount on your bill, if any. TOTAL NEW CHARGES The total amount before any discounts that you owe this billing cycle. TOTAL GROSS The grand total of your AMLP bill after all applicable discounts and credits. TOTAL DISCOUNT The discount you can achieve by paying AMLP by your "IF PAID BY" date on your bill. TOTAL NET The total amount due if you pay by your "IF PAID BY" date on your bill. This area is for customer messages and notifications. If, for any reason, you believe that your bill is inaccurate, please write to AMLP at PO Box 823 in Ashburnham, visit us, call us at 978 827-4423 or send us an email. Please have your bill with you and be ready to explain why you feel it to be inaccurate and the reason why you feel that the error might have occurred. If, after receipt of the decision of the General Manager, you still consider your bill to be inaccurateâ€”you have the right to appeal to the General Manager. If, after this appeal, you still consider any amount or arrangement inaccurate, you have the right to appeal to the MA Dept. of Public Utilities. If you are having difficulty paying your utility bill, a payment plan may be arranged. Under this plan a past due balance may be paid in installments over a specified period. Current charges will be due in addition to the payments on the past due balance. The length of time that a payment plan extends will vary from a minimum of 4 (four) months depending upon the past due balance and a plan agreed to by Customer Service.